MOSQUE ATTACK SUSPECTS LINKED TO ISIS! 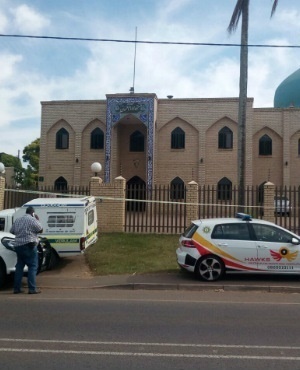 THE accused in the Verulam mosque attack have been linked to terrorist groups al-Qaeda and Isis. In her final argument yesterday at the bail hearing of the 11 accused, prosecutor Adele Barnard said their involvement with terrorist groups would cause anger and fear if they were released on bail. The state and defence teams presented their closing arguments at the Verulam Magistrates Court after a four-week-long bail hearing. “The state has evidence that the men are linked to international terrorist groups. “During their arrest they were found with material on how to make bombs. Barnard read out the statement from accused number 18. She said the statement supported the state’s version that the accused was the ringleader. Lawyers for accused number 18 denied he had made such a statement, calling it a fabrication. Magistrate Irfaan Khalil reserved bail judgment until 27 November as he had to go through about 800 pages of evidence. The suspects were arrested earlier last month and face 14 charges including murder, attempted murder, arson and extortion. They are accused of attacking worshippers at the Shia Mosque in Verulam. The state said the conversation on the accused’s WhatsApp group suggested they belonged to Sunni and Shia Muslim groups.